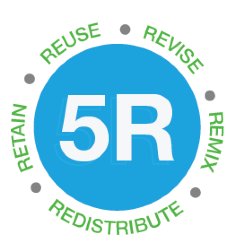 Adopt (Reuse) existing OERs - up to $1250: Incorporate an existing open textbook (including your own), open courseware, and/or other OER materials in your course, with minimum or no modifications. For example, fully adopt a single open textbook to replace a commercial textbook (see examples of open textbooks from Openstax, Open SUNY, and Open Textbook Library). Or, fully adopt an open courseware (see examples at Open NYS Lumen Learning). Multi-section course teams that adopt OERs across all sections of the course will receive awards for each instructor. Adapt (Modify/Remix) new and/or existing OERs - up to $2500: Modify/remix and combine existing and/or newly created OERs to meet the needs of your course. This requires significant mixing and matching of portions of multiple OERs together with your newly created content to bridge gaps in available resources. For example, remix chapters and content from several different open textbooks and other OER resources, combined with your lecture notes, assignments, chapters, problem sets, etc. Multi-section course teams that adapt OERs across all sections of the course will receive awards for each instructor. Create - up to $2500: Build from scratch a new OER where there are insufficient OERs available to meet the learning needs in your course. For example, author a new open textbook, create a new open courseware, etc. Use existing OERs and/or newly created content. Any newly created content will be made open through Creative Commons license structures that permit authors to retain their copyright while allowing others to reuse, revise, remix, redistribute, and retain their works. (for more information see the open licenses section on the Library's OER guide and the Creative Commons site). Save students 50% or more of the total cost for textbooks and other course materials. Preference will be given to courses saving students a higher percentage of the cost of textbooks/course materials. Commit to using OERs each time the course is taught for the next three years. Deadline to apply is May 31, 2018. Proposal: Deadline for submission is May 31, 2018. Awardees will be notified by June 8, 2018. Proposals will be reviewed by a committee of librarians, CELT staff, and administrators. Awardees must implement OERs in courses to be offered no later than Spring 2019. Funding: Awardees will receive 50% of the funds up front and another 50% when OERs are implemented and the course is offered. Letter of Agreement: Awardees will be asked to sign a letter of agreement. Final Report: During or at the end of the first semester of implementation, awardees must submit a final report summarizing challenges and accomplishments of implementing OERs, and reporting enrollment and cost savings data. This data will be submitted to SUNY in order to secure additional funding from the SUNY OER Initiative (for more details see section below “Already Using OERs?") . OER Showcase: Awardees will be invited to an OER Showcase at SBU to share their OER experiences and findings with other colleagues. In addition, there will be a call for participation on an OER panel discussion at the University Libraries’ Open Access Symposium, held annually in October. Deposit to Academic Commons: Awardees are encouraged to deposit any new and/or revised OER resources to SBU’s open access repository, Academic Commons, with the appropriate Creative Commons (open) license.